Driving home from our son's wedding in Northern California last weekend, we were hoping to find fast, healthy food offerings near the freeway. Foolishly hoping, it seems. Healthy options were scarce, and limited to sugary yogurts and a few sandwiches on whole grain bread (Starbucks), and several carb-and-salt-heavy 6-inch subs loaded with fresh-like veggies (Subway). Culinary weapons-of-human-destruction were easy to spot, though, at all the usual fast-food suspects... and were garishly hawked by Taco Bell, Jack-in-the-Box, McDonald's, and Carl's Jr, among others. Mr. Haley failed to mention the 1,960 mg of sodium (salt) in one of these drippy concoctions. That's equal to the salt in 15 small orders of McDonald's fries. Equal to the salt in 9 servings of Doritos Nacho Cheese tortilla chips. 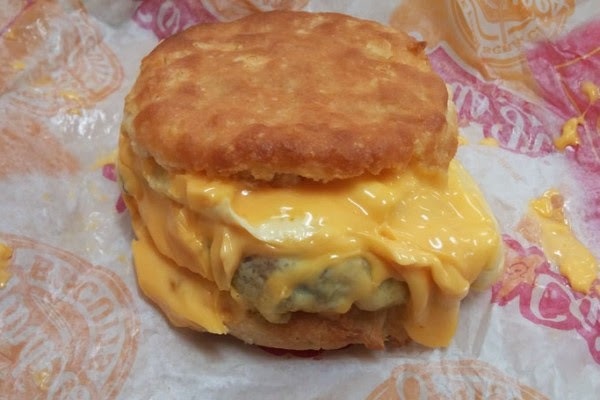 He also failed to mention the 820 calories (equal to 4 two-packs of Reese's Peanut Butter Cups) and 58 grams of fat (equal to 2 Big Macs) found in Carl's Jr.'s oozing Double Loaded Omelet Biscuit. And, of course, he failed to mention more than 100 chemicals, emulsifiers, additives, fillers, and artificial flavors and colors included as ingredients in this salty-fatty food bomb. 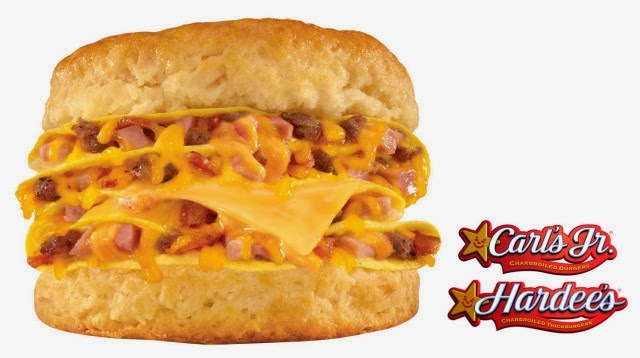 Clearly, and by a wide margin, Carl's Jr.'s fevered bid to build and proudly sell an astonishingly unhealthy breakfast product wins our vote for the most disgusting fast-food last week along Highway 101. My question continues to be... why the heck does our government allow this and similar addictive, poisonous fake foods to be sold to hook the American public into ruining their health? Why does our government, which is tasked to protect Americans, allow mega-corporations to deliberately fatten and poison people in order to fatten corporate profits? I like fast food sometimes but not as regular since it is not healthy. I always try to take organic food such as reishi powder made food and others natural ingredients. Because I am health conscious person.